A330-300 (на снимке) - среднемагистральный вариант A330 с большой вместимостью. "Airbus" планирует ввести в эксплуатацию в 2010 году вариант A330-200 с увеличенной массой, используя задержку в программе создания лайнера Boeing 787. 2 ноября 1992г. : успешный первый полет выполнил дальнемагистральный A330. В августе 1997 года в воздух поднялся первый экземпляр укороченного A330-200. Летом 1998 года, после испытательных полетов с двигателями CF6 и PW4000, начались полеты с двигателями Trent. Во время испытаний на определение минимальной расчетной скорости отрыва самолета из-под защищенной нижней хвостовой части фюзеляжа разлетались искры. За первым полетом в 1992 году последовал период интенсивных летных испытаний. A dramtic motion-blur photograph showing how sleek an A330 can look. 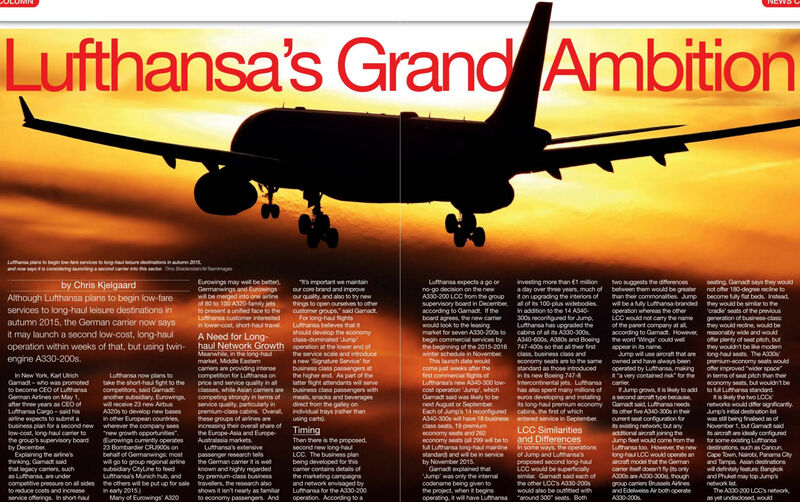 Lufthansa plans to begin low-fare services to long-haul leisure destinations in autumn 2015, and now says it is considering launching a second carrier into this sector. 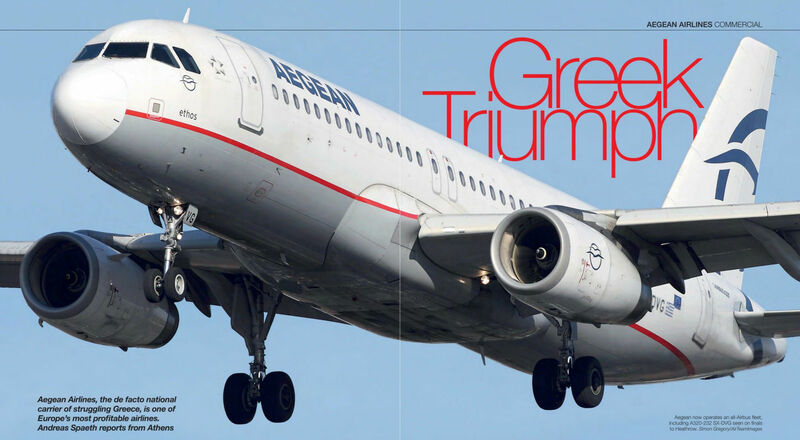 Aegean now operates an all-Airbus fleet, including A320-232 SX-DVG seen on finals to Heathrow. 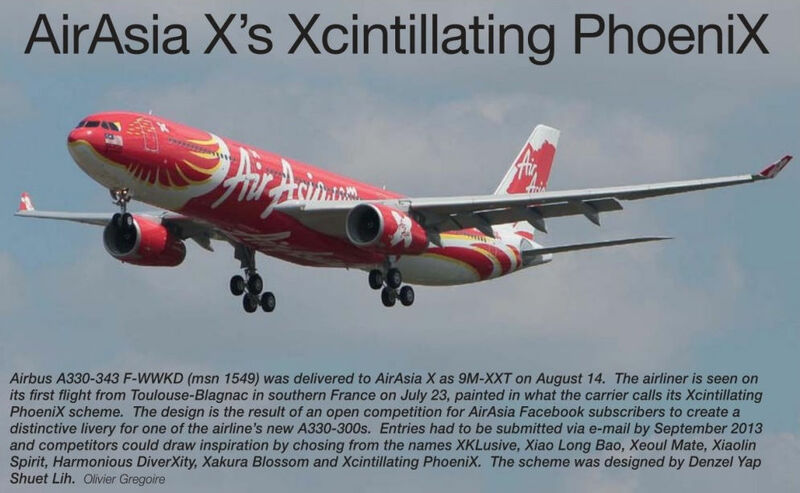 Airbus A330-343 F-WWKD (msn 1549) was delivered to AirAsia X as 9M-XXT on August 14, 2014. 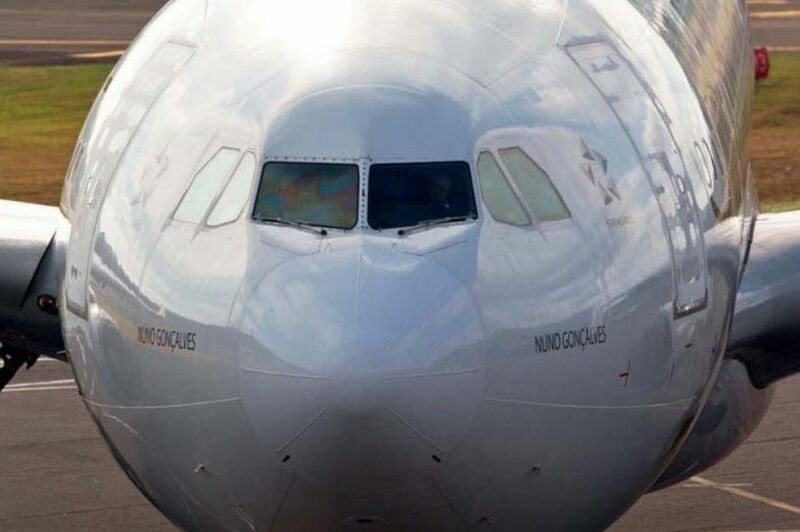 The airliner is seen on its first flight from Toulouse-Blagnac in southern France on July 23, painted in what the carrier calls its Xcintillating PhoeniX scheme. 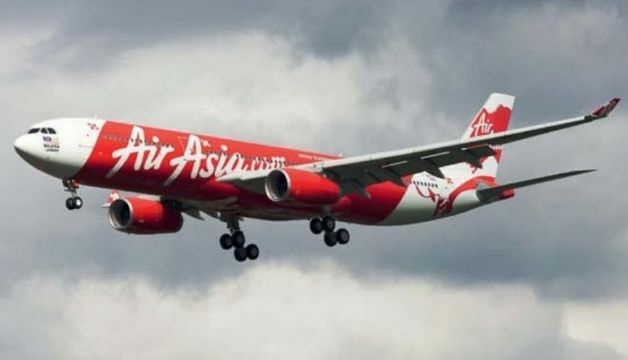 The design is the result of an open competition for AirAsia Facebook subscribers to create a distinctive livery for one of the airline's new A330-300s. Entries had to be submitted via e-mail by September 2013 and competitors could draw inspiration by chosing from the names XKLusive, Xiao Long Bao, Xeoul Mate, Xiaolin Spirit, Harmonious DiverXity, Xakura Blossom and Xcintillating PhoeniX. The scheme was designed by Denzel Yap Shuet Lih. 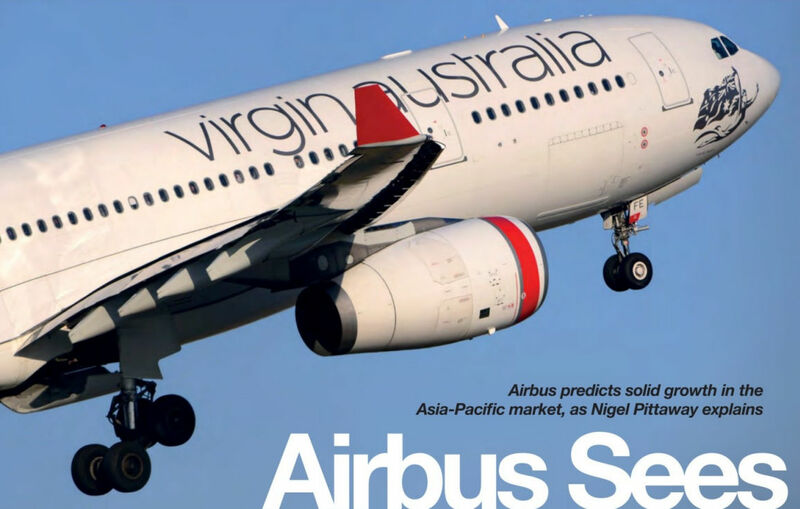 AirAsia X is among A330 operators pushing for an A330neo. A330s are used by a range of operators. Low-cost long-haul operator AirAsia X has converted 11 existing A330ceo orders to A330neos, it was announced in January 2016. 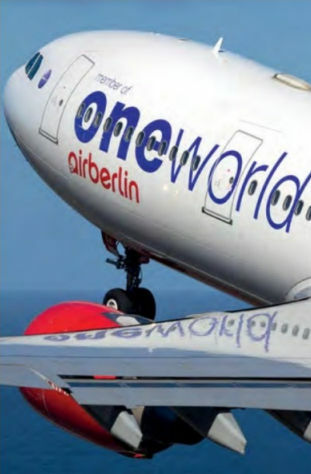 Despite its close partnership with majority stakeholder Etihad Airways, airberlin will continue to be part of the oneworld alliance. Airbus flew Air China's 50th A330 on September 7, 2015. The jet, A330-343 8-5977 (msn 1658, F-WWYC), pictured at Toulouse Blagnac, features the increased 242-tonne maximum take-off weight capability cleared for the type. 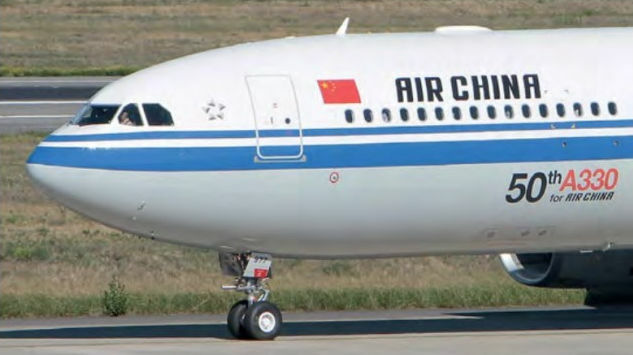 Once delivered, it will take Air China’s fleet of A330-300s to 20; the airline also operates 30 A330-200s. 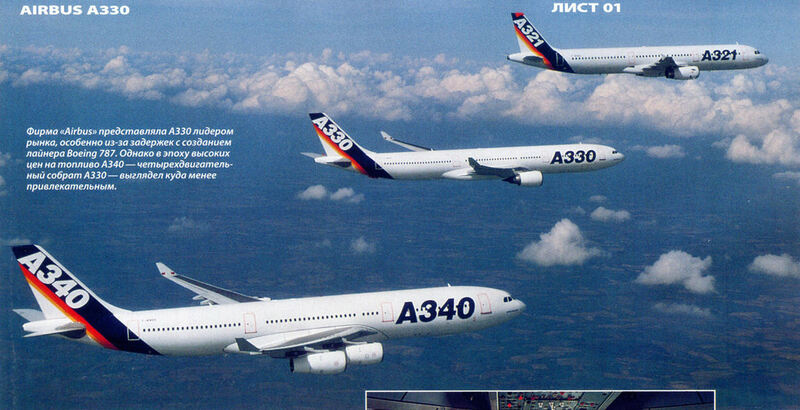 Its initial A330-200 was delivered in 2006 and its first A330-300 four years later. "Air France". 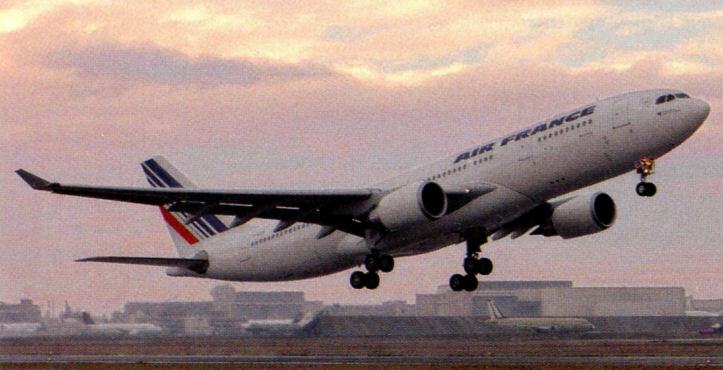 К началу 2009 года авиакомпания "Air France" располагала флотом из 16 лайнеров A330-200, которые использовались преимущественно на дальних маршрутах - в США, Латинскую Америку и Африку. 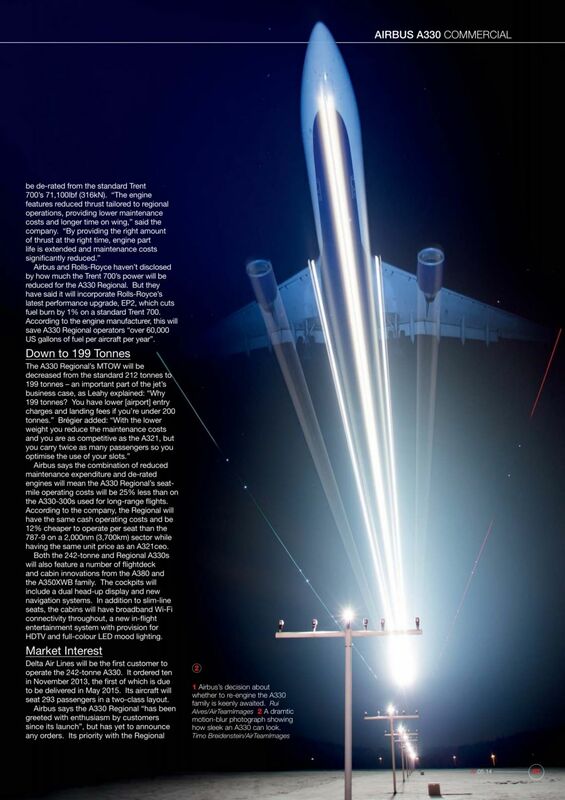 1 июня 2009 года произошла катастрофа самолета A330, выполнявшего рейс Рио-де-Жанейро - Париж. Точная причина катастрофы пока не установлена. Салоны самолетов A330 авиакомпании "Air France" имеют от 219 до 291 мест. Ex-Sabena A330-223 OY-GRN (msn 230) can only operate into Kangerlussuaq on the west coast, from where its passengers and cargo are distributed around Greenland using the Dash 8 fleet. 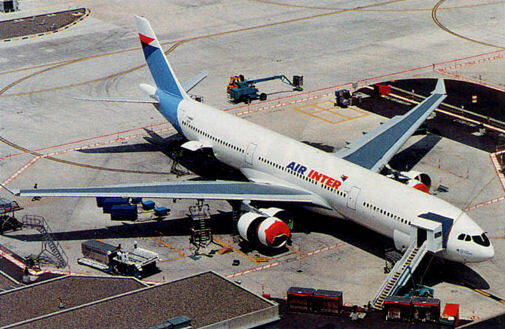 Французская авиакомпания "Air Inter" первой начала эксплуатацию A330-200. Европейская поддержка программы A330/A340 была очень мощной благодаря таким национальным авиакомпаниям как "Lufthansa" и "Air France", начавшим коммерческую эксплуатацию A340. Air Serbia A330-202 A6-EYC (msn 885), which is to become YU-ARA at Belgrade on May 11, 2016. 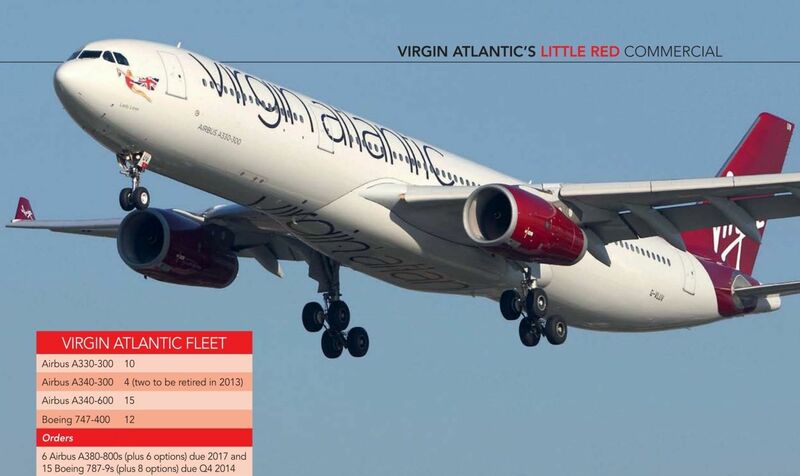 This is the airline’s first long-haul aircraft, and will be used on services to New York JFK from June. 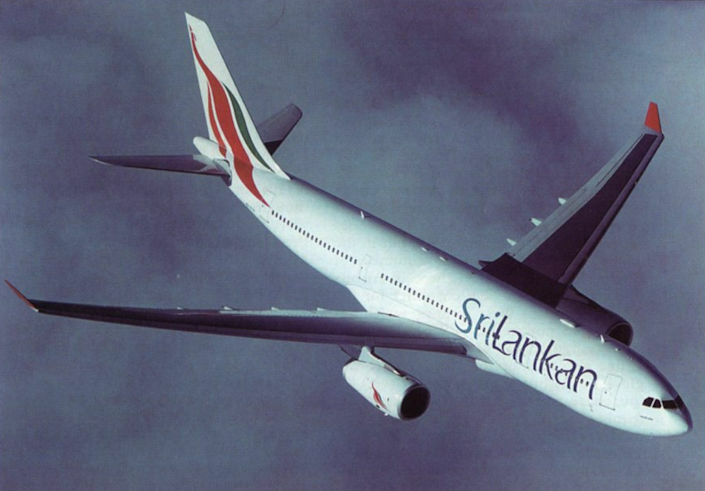 Both A330s were formerly operated by Jet Airways, which like Air Seychelles is an Etihad partner airline. 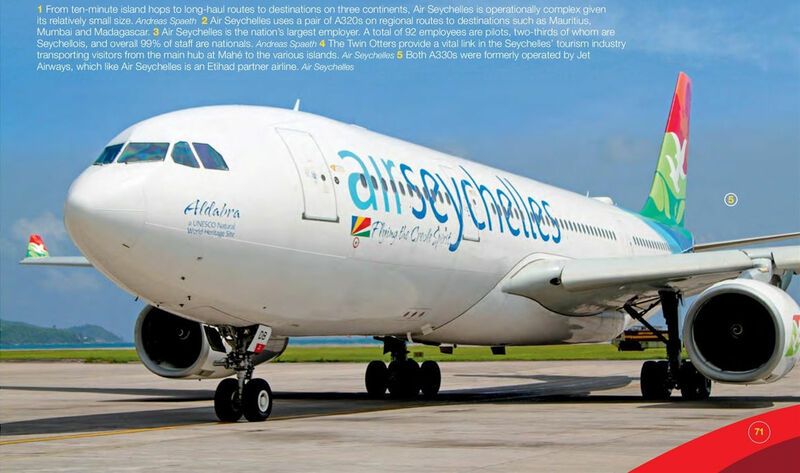 Air Seychelles is returning to Europe this summer with its A330s, reflecting a growing tourist trade. Three of the four Airbus A330-342s operated by Air Transat have received a special livery to mark the Canadian charter carrier’s 30th anniversary. Here C-GTSO (msn 132) is pictured at Toronto. The jets will retain the livery for the rest of this year. The Canadian carrier Air Transat has introduced a revised livery, seen here on Airbus A330-243 C-GTSN (c/n 369) at Toronto Lester B Pearson International Airport. The livery was unveiled in November 2017 to coincide with the airline's 30th birthday. 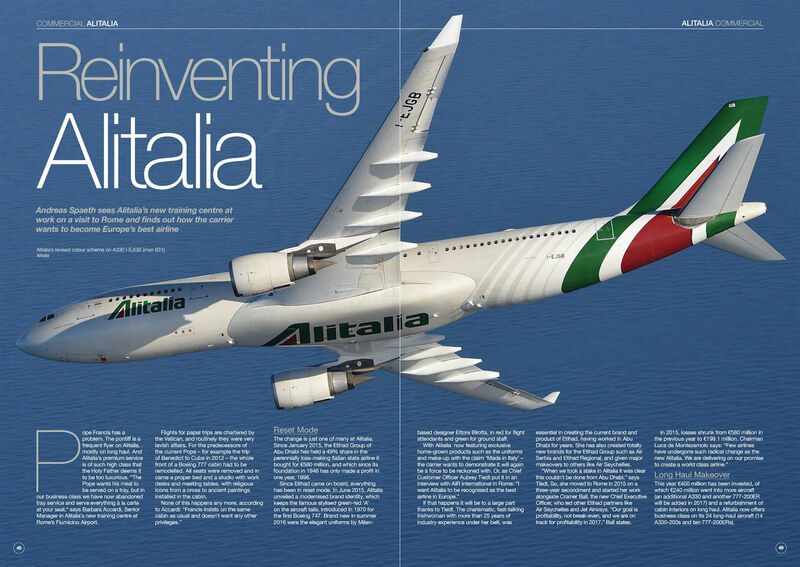 This year has seen two more A330s join the fleet as Alitalia looks to grow in long-haul; another will arrive in 2017. Alitalia is seeking to grow its long-haul business and has introduced a new business class on its A330s and Boeing 777s. Airbus A330-202 l-EGJA (msn 825), on finals to Milan Malpensa on June 5, 2015, shows the new ‘pinstripe effect’ detail on the rear fuselage, leading up to the enlarged tricolour logo. Alitalia's revised colour scheme on A330 l-EJGB (msn 831). American Airlines, the world's largest airline, posted a $1.04 billion net profit in the first half of 2017. 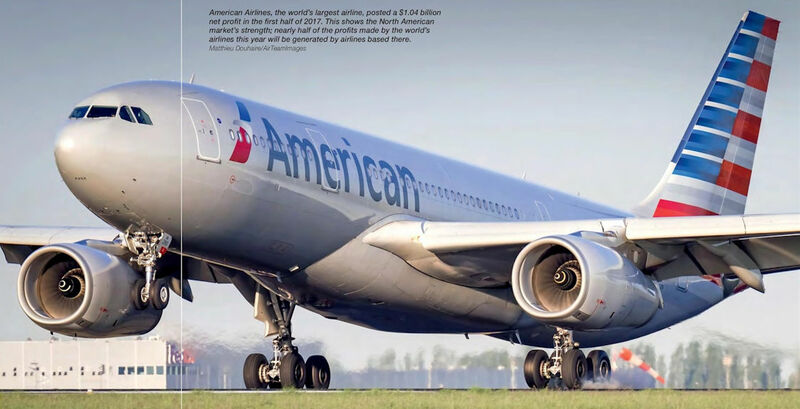 This shows the North American market's strength; nearly half of the profits made by the world’s airlines this year will be generated by airlines based there. 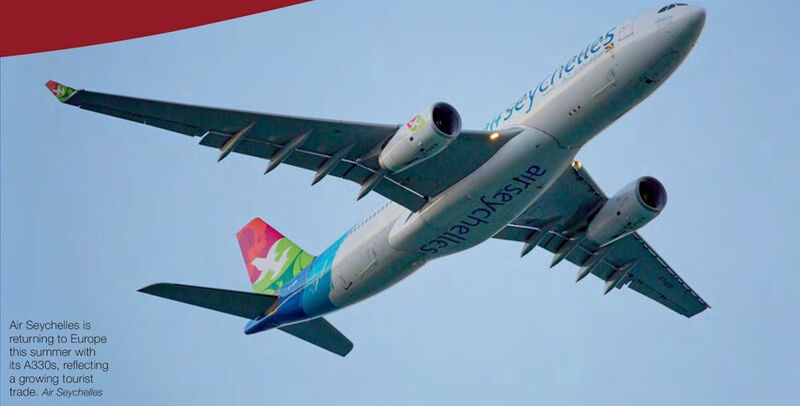 SATA Air Acores has rebranded to Azores Airlines as it seeks to bolster its competitive position in offering air travel to its Azores Islands home in the North Atlantic, around 845 miles (1,360km) west of Portugal. The carrier is leasing two Airbus A330-203s, one of which (CS-TRY, msn 970) has been repainted in the relaunched carrier's distinctive identity which features a sperm whale on the fuselage. The specially-marked A330-200 PR-AIV is one of the A330s used for long-haul flights by Azul Brazilian Airlines. Airbus A330-223 M-ABFL (msn 324) was rolled out of the Air Livery paintshop at Manchester Airport on March 20, 2013 in Brussels Airlines colours. The airliner previously flew with Air Australia as VH-SSA and will become OO-SFU on entering service with its new operator. 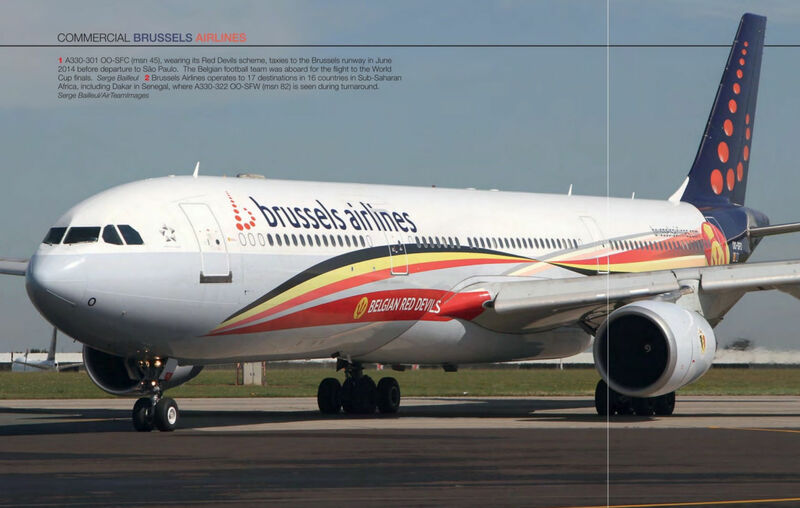 Brussels Airlines has two A330-200s and five -300s already in service. Brussels Airlines operates to 17 destinations in 16 countries in Sub-Saharan Africa, including Dakar in Senegal, where A330-322 OO-SFW (msn 82) is seen during turnaround. A330-301 OO-SFC (msn 45), wearing its Red Devils scheme, taxies to the Brussels runway in June 2014 before departure to Sao Paulo. 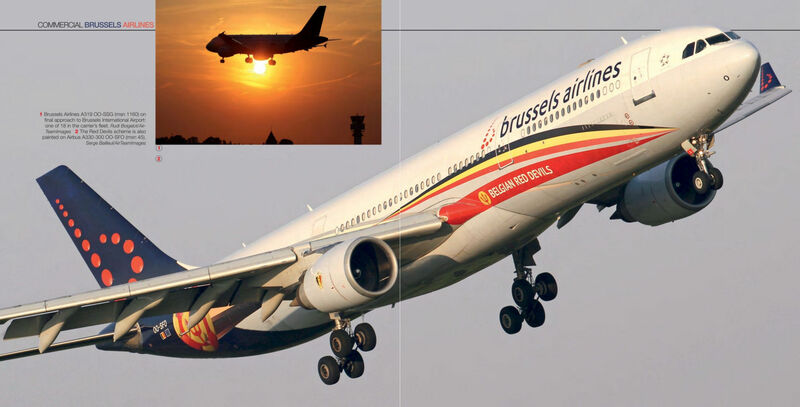 The Belgian football team was aboard for the flight to the World Cup finals. The Red Devils scheme is also painted on Airbus A330-300 OO-SFO (msn 45). 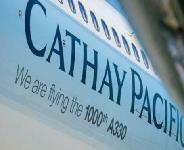 Авиакомпания "Cathay Pacific" выбрала самолеты A330 в варианте с двигателями Rolls-Royce Trent. Авиакомпания также эксплуатирует дальнемагистральные самолеты A340. 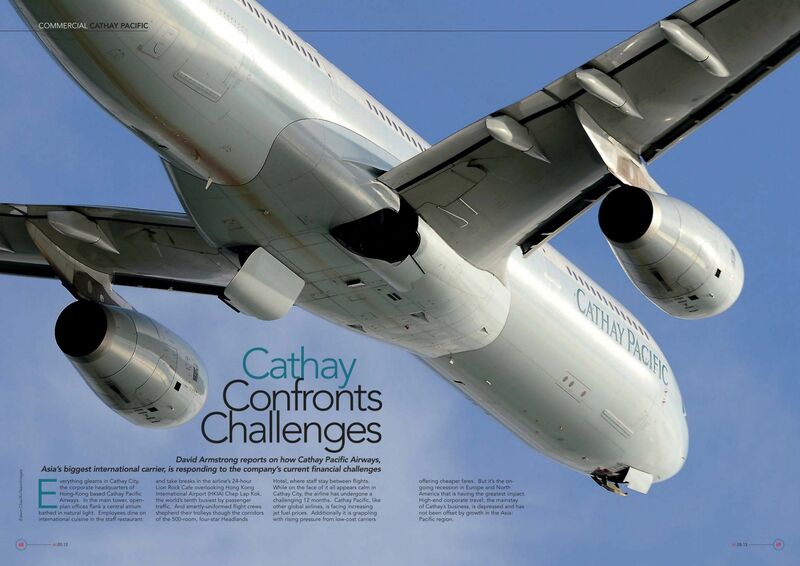 Hong-Kong based Cathay Pacific Airways operates a fleet of 37 Airbus A330-300s. 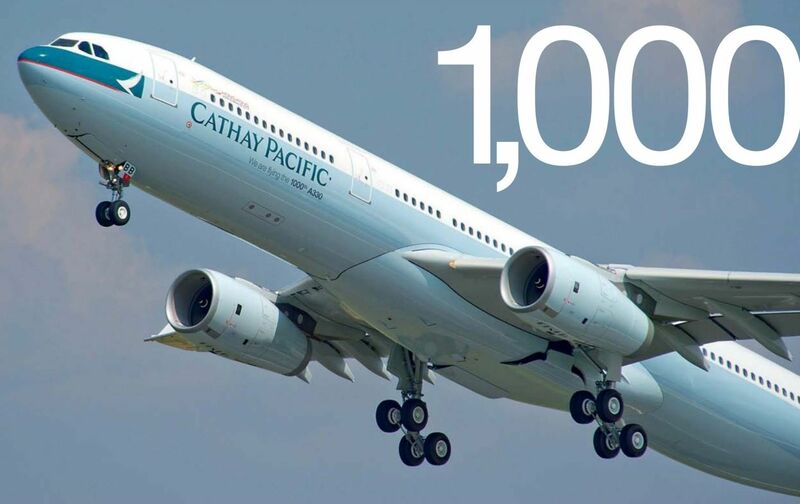 Airbus delivered the 1,000th A330 (msn 1436) to Cathay Pacific Airways on July 19, 2013. 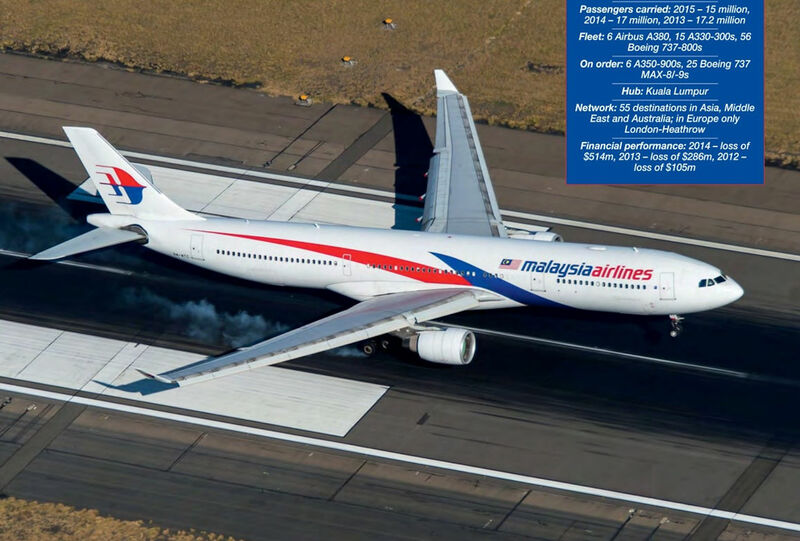 The aircraft is registered B-LBB with the slogan 'We are flying the 1,000th A330' on each side of the forward fuselage. 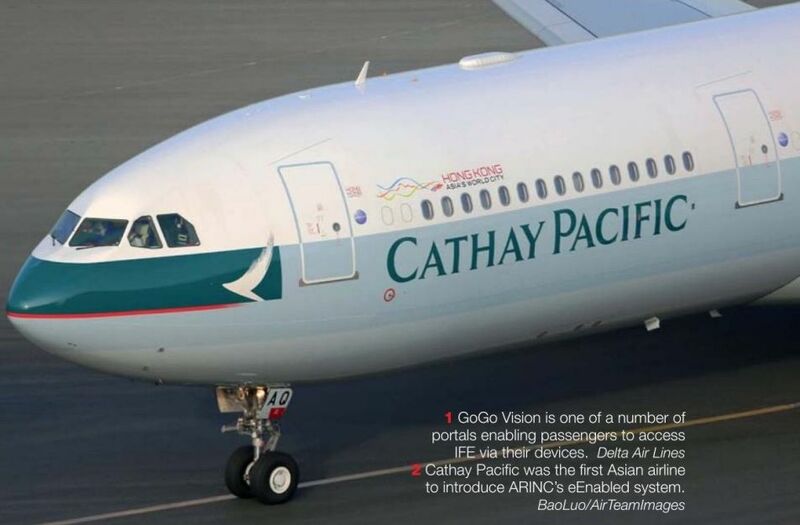 Cathay Pacific was the first Asian airline to introduce ARINC’s eEnabled system. Airbus A330-343X F-WWTR (msn 7420, to become RP-C3341) is the first of the type for Cebu Pacific Air of the Philippines, leased from CIT Aerospace. Cebu will lease eight A330-300s powered by Rolls-Royce Trent 772Bs, two of which will be delivered in both 2013 and next year. The first made its maiden flight from Toulouse-Blagnac on May 15, 2013 and is seen making a test flight from the south-west France airport eight days later. It was delivered on June 13 and will enter service on long-haul flights between Manila and Dubai on October 7. "China Eastern". К концу 2008 года авиакомпания "China Easterns эксплуатировала пять A330-200 и 15 A330-300, новых заказов пока не последовало. Контракт на 20 самолетов A330-300 подписан в 2004 году, но в процессе реализации был пересмотрен в пользу закупки самолетов не одной, а двух модификаций. Авиалайнеры имеют двухклассную компоновку и летали на престижной линии Шанхай - Лондон, однако в 2009 году из-за глобального экономического кризиса рейсы пришлось прекратить. Самолеты A330 и A340 авиакомпании "China Eastern" в целях унификации оснащены двигателями Rolls-Royce Trent; A330-200 используются для полетов в Индию, Японию, Сингапур, Южную Корею, Австралию и Таиланд. Первый A330 авиакомпания получила в 2006 году в варианте A330-300 (на снимке), став первой китайской авиакомпанией, приступившей к эксплуатации лайнеров данного типа. Самолеты A330-300 имеют 300-местную конфигурацию (38 мест бизнес-класса) и пришли на смену самолетам A300-600, в первую очередь на линиях внутри дальневосточного региона. A330 оснащены современной авионикой фирмы "Rockwell Collins". 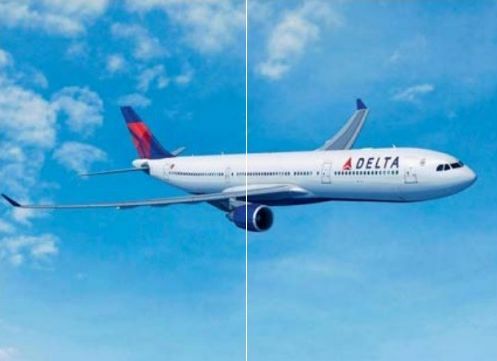 Delta Air Lines has launched a new blue and red ribbon livery and has been rebranded simply as Delta because most customers refer to the airline as such. The livery is closer in style to that of alliance partner Air France and there is talk of the two introducing a joint livery. A330-300, N819NW (msn 858), is one of 32 in service with Delta Air Lines. 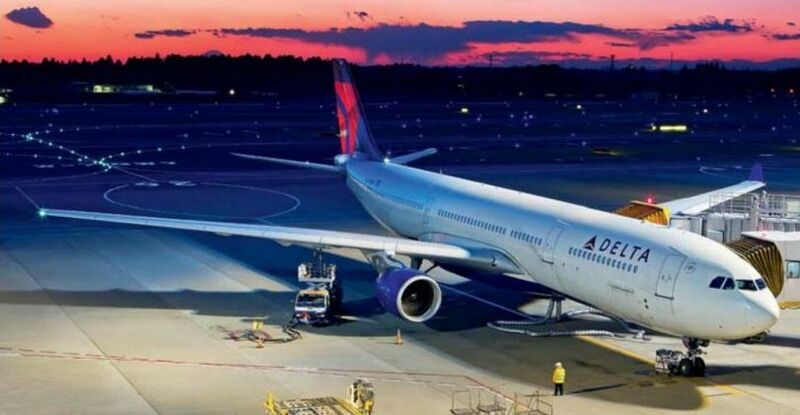 All of Delta's A330s are former Northwest Airlines aircraft that were registered to Delta on October 29, 2008 the day the US Department of Justice approved the merger between the two carriers. 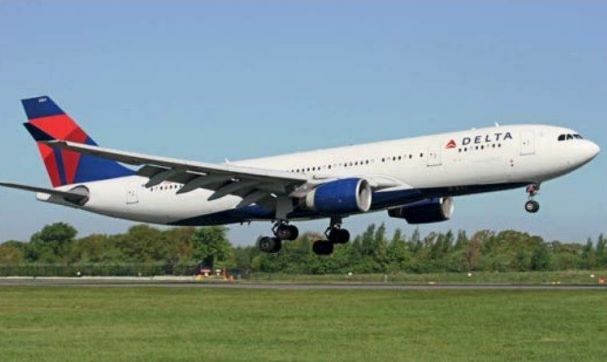 Delta will be the first to receive the 242-tonne A330-300, in 2015. "Emirates". Первый A330 "Emirates" получила в 1999 году (A330-200), а летом 2009 года ее парк насчитывал уже 29 лайнеров этого типа. Оснащенные двигателями Rolls-Royce Trent 772B самолеты выполняют рейсы в двухклассной компоновке (27 мест бизнес-класса и 251 - эконом-класса), работают на региональных маршрутах, а также выполняют полеты в Китай, Европу, Индию, на Шри-Ланку и в США. Авиакомпания "Emirates" в числе первых разрешила пассажирам пользоваться в полете мобильной связью, используя систему AeroMobile, дебют которой состоялся в 2008 году. AeroMobile быстро внедрили на всех самолетах A330 этой авиакомпании. В июле 2008 года "Emirates" анонсировала закупку еще 30 самолетов A330-300 (и 30 единиц A350XWB), представитель авиакомпании назвал самолет "самым экономичным средством перевозки 300 пассажиров на линиях средней протяженности с высоким уровнем комфорта". 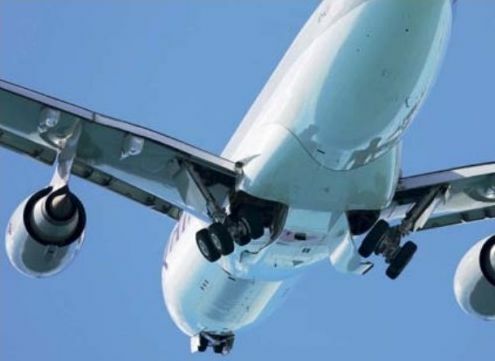 Поступление новых A330 намечено на 2012 год - предположительно они будут оснащены новым программным обеспечением Honeywell SmartLanding, которое "Emirates" планирует установить на все свои самолеты, включая A380. 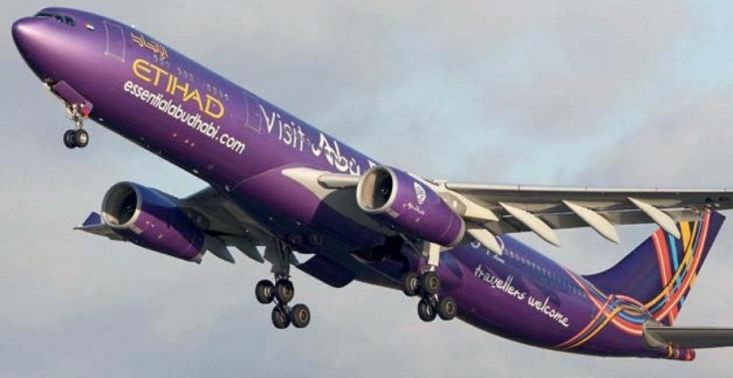 Etihad Airways Airbus A330-243 A6-EYH (msn 729, ex F-WWKR) departs Manchester in the UK for Abu Dhabi on November 5, 2014, sporting a special livery promoting Expo 2015 in Milan, Italy, which runs from May 1 to October 31 next year. An Alitalia A330 also wears a similar scheme. Airbus A330-200 D-AXGA (msn 530) arriving at Hamburg on July 1, 2015 following repainting in Eurowings livery. The aircraft, owned by GECAS, was previously leased to EVA Airways. It is the first in a fleet of up to seven A330s that Eurowings will use for long-haul, low-cost services from Cologne/Bonn to Dubai, Bangkok and Phuket in Thailand, Varadero in Cuba and Punta Cana in the Dominican Republic, which are planned to start on October 25. 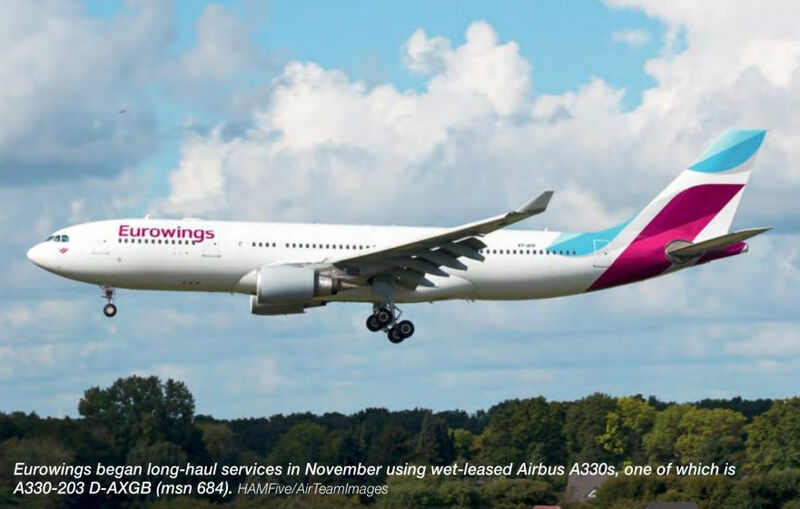 Eurowings began long-haul services in November 2015 using wet-leased Airbus A330s, one of which is A330-203 D-AXGB (msn 684). 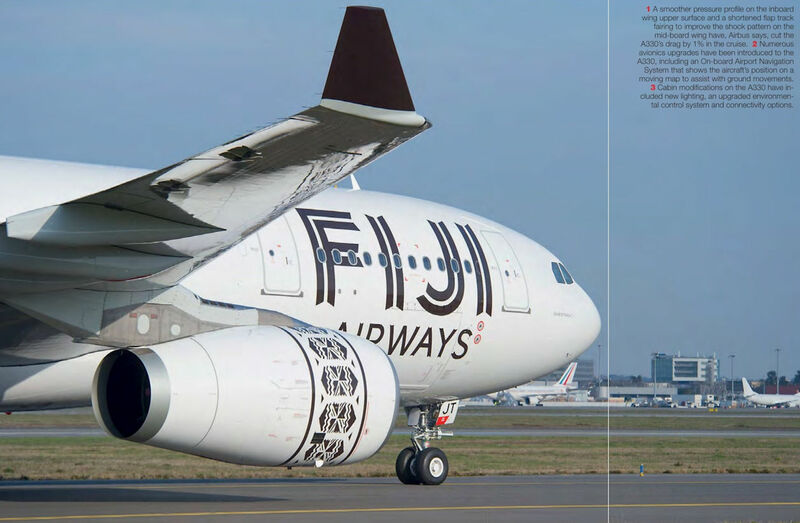 Airbus A330-243 DQ-FJT (msn 1394, wearing test registration F-VZWKD) was delivered to Fiji Airways on March 16, 2013. The aircraft is seen making its maiden flight at Toulouse, France, on February 19, painted in the carrier's new livery. 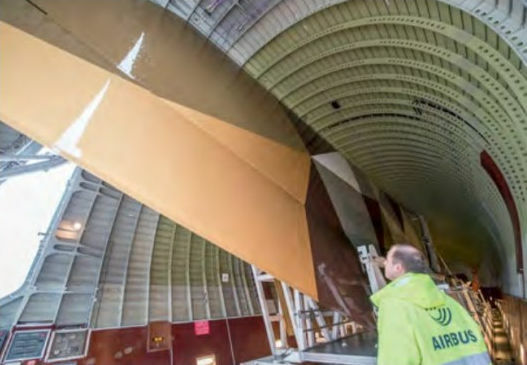 A smoother pressure profile on the inboard wing upper surface and a shortened flap track fairing to improve the shock pattern on the mid-board wing have, Airbus says, cut the A330’s drag by 1% in the cruise. 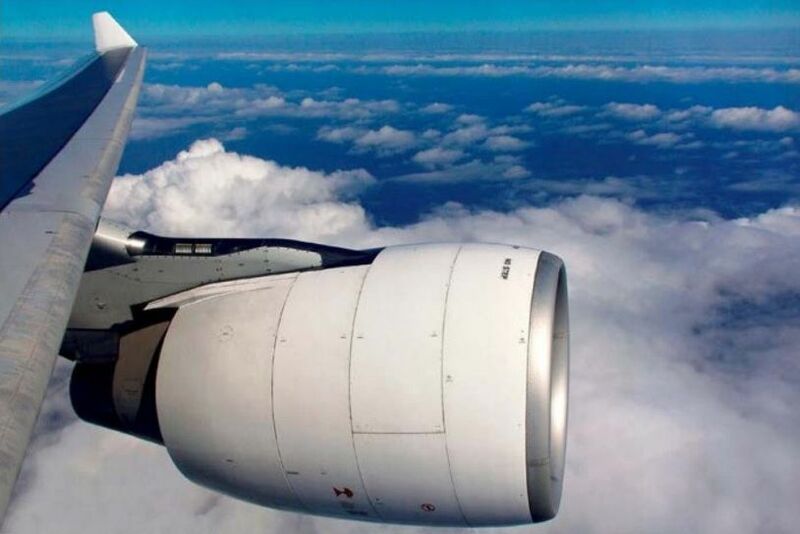 GE Aviation’s TrueChoice Transitions pool covers every major turbofan-engine model GE Aviation has made over the past 30 years, including CF6-50C2S. This CF6-50C2-powered Finnair Airbus A330-302 OH-LTT (msn 1088) is pictured departing Helsinki. 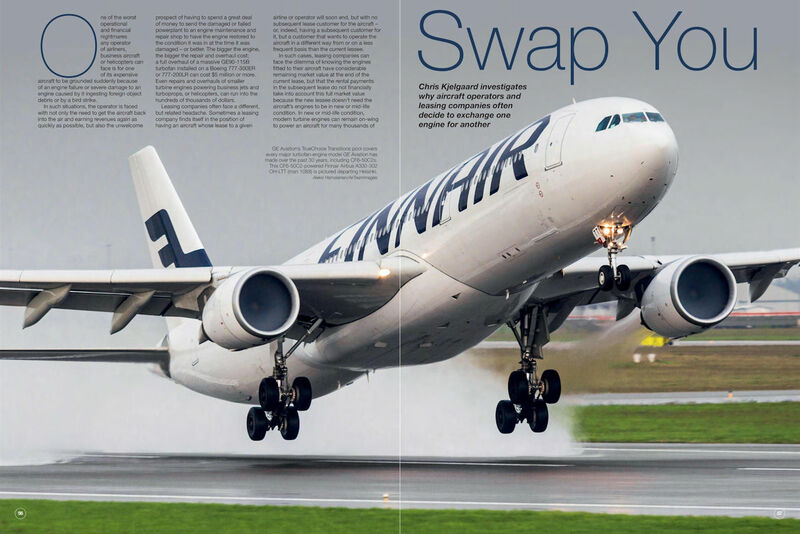 A330-300 OH-LTM (msn 994) was delivered to Finnair in March 2009 and is one of eight in service with the Finnish carrier. A330-300 CS-TMT (msn 96) in the colours of Saudi low-cost carrier Flynas landing at Manchester. 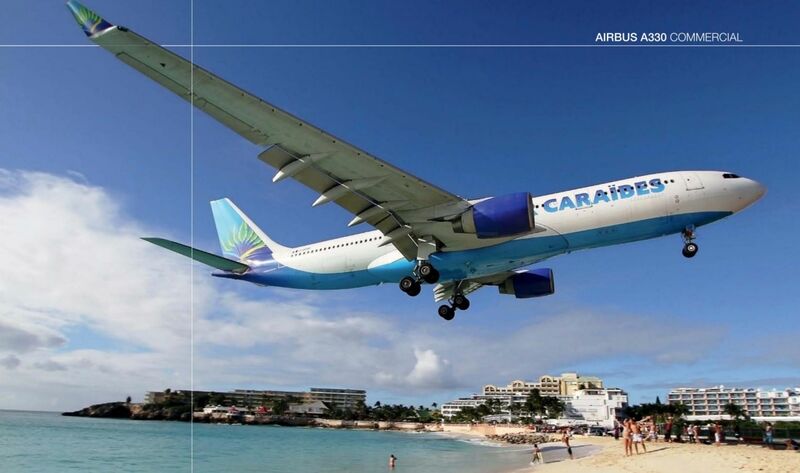 CS-TMT was leased from Hi Fly between May and November 2014. 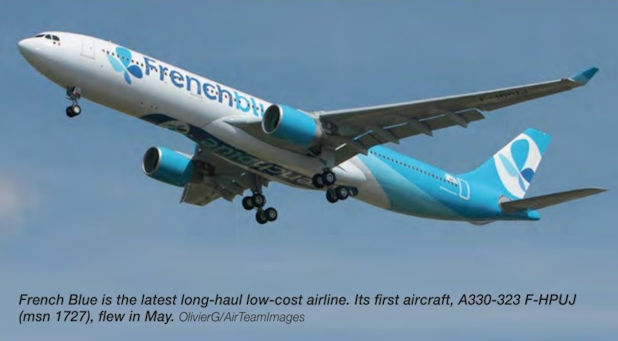 French Blue is the latest long-haul low-cost airline. 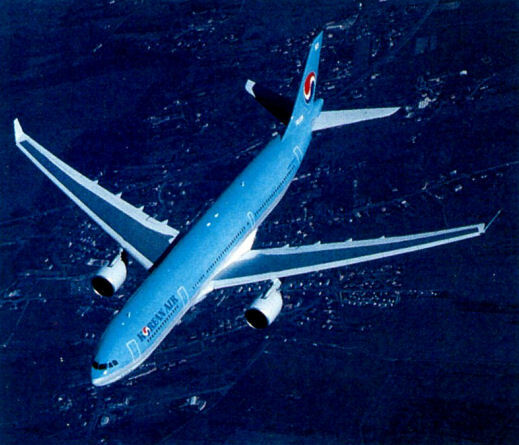 Its first aircraft, A330-323 F-HPUJ (msn 1727), flew in May 2016. 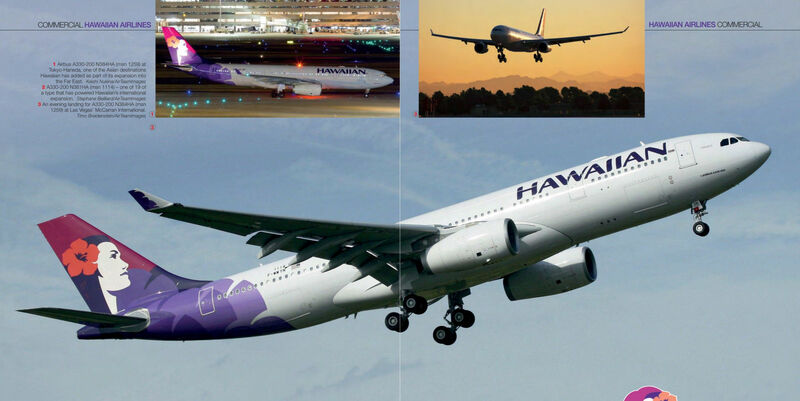 A330-200 N381HA (msn 1114) - one of 19 of a type that has powered Hawaiian's international expansion. An evening landing for A330-200 N384HA (msn 1259) at Las Vegas’ McCarran International. Airbus A330-200 N384HA (msn 1259) at Tokyo-Haneda, one of the Asian destinations Hawaiian has added as part of its expansion into the Far East. 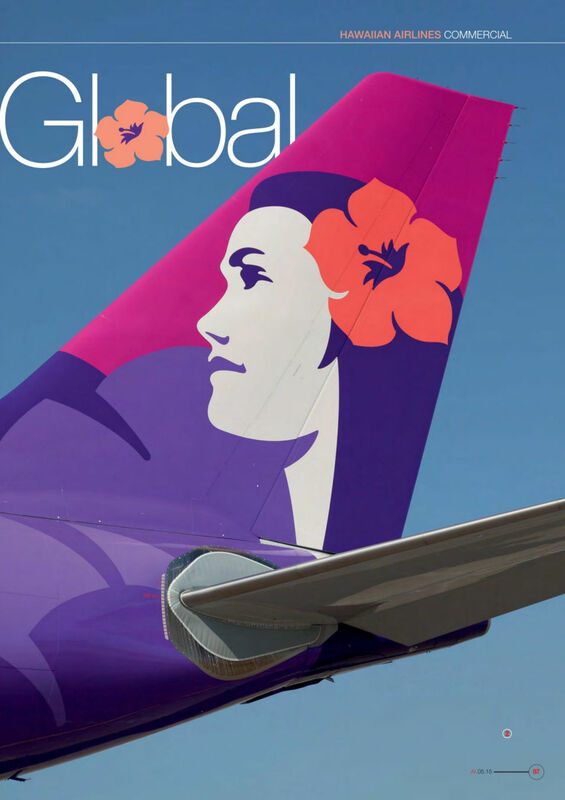 This colourful tailfin design is part of Hawaiian’s efforts to reflect its home islands' character. 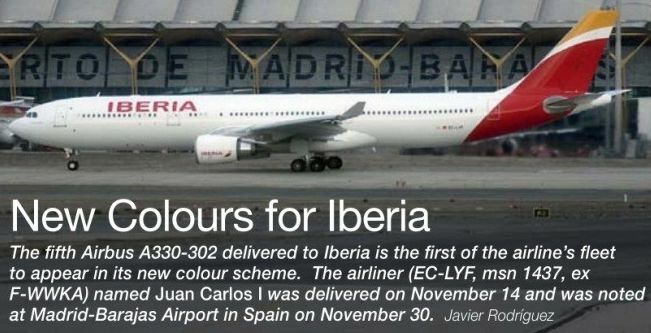 The fifth Airbus A330-302 delivered to Iberia is the first of the airline’s fleet to appear in its new colour scheme. The airliner (EC-LYF, msn 1437, ex F-WWKA) named Juan Carlos I was delivered on November 14, 2013 and was noted at Madrid-Barajas Airport in Spain on November 30. One of Iberias eight A330-302s, EC-LZJ (msn 1490). Iberia has invested in improving the product in its long-haul aircraft, including adding new seats and on-board Wi-Fi. Iberia marked its 90th anniversary with a private event at Cuatro Vientos aerodrome, Madrid on June 25, 2017. 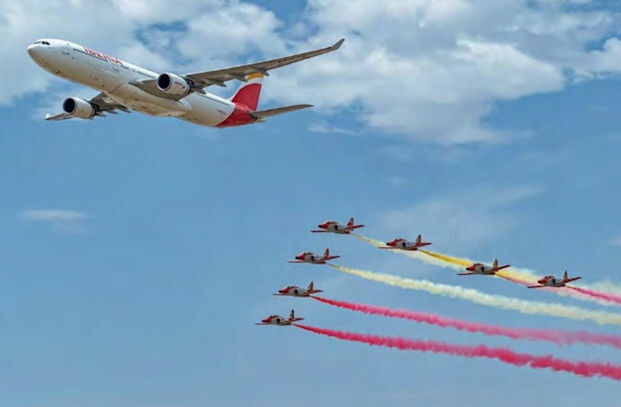 Among the celebrations was a flypast by Airbus A330-302E EC-LZX (msn 1507) in formation with the Ejercito del Aire (Spanish Air Force) Patrulla Aguila. The introduction of a new colour scheme, seen here in contrast to the previous livery on aircraft at Madrid-Barajas, coincided with major restructuring at Iberia. Airbus A330-202 G-ZYGL (msn 1555) that Jet2 is leasing from AirTanker on finals to runway 06L at Palma de Mallorca. Noted visiting Madrid-Barajas Airport in Spain on February 5, 2013, was Airbus A330-243 Prestige UP-A3001 (msn 863, ex 3B-TSL) of the Government of Kazakhstan. It transported the Kazakh President, Nursultan Nazarbayev, to Spain to discuss trade and co-operation, and to a meeting with King Juan Carlos I. The VIP aircraft was delivered to Kazakhstan in March 2010. Airbus A330-243CJ UP-A3001 (msn 863) of the Kazakhstan Government arrived at Manchester Airport on June 12, 2013 for repainting by Air Livery. 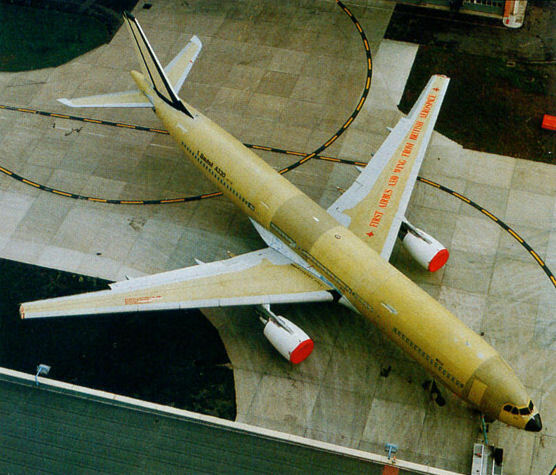 It was rolled out six days later with a new blue, white and yellow stripe along the fuselage and tail. The aircraft departed the same day. KLM will take delivery of its 17th and final A330 by the end of the year. Сочетание большой дальности полета со значительной массой полезной нагрузки позволяет самолетам A330 выдерживать конкуренцию на дальневосточных маршрутах. Korean Air Lines Airbus A330-223 HL8212 (msn 1155, ex F-WWKI) carries the design of a Children’s Drawing Competition along its rear fuselage. The special markings were applied in October 2013. Airbus A330-202 EC-MOU (msn 1777) departs Manchester after repainting by Air Livery into the livery of Level, the International Airlines Group’s new low-cost long-haul airline which started revenue flights to North American destinations from Barcelona in June 2017. A330-323X 9M-MTC (msn 1229) touching down at Sydney Kingsford-Smith Airport. 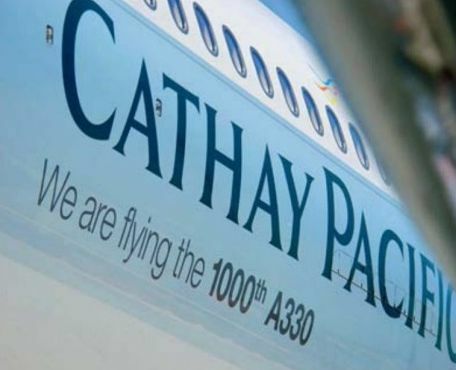 The carrier has 15 A330s; it has six A350-900s on order. 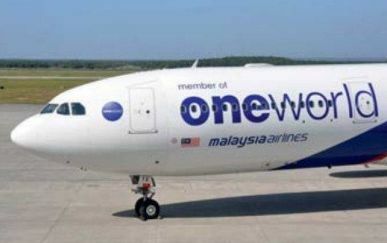 Malaysia Airlines joined the oneworld alliance on February 1, 2013. Northwest Airlines/Delta Air Lines. Авиакомпания "Northwest Airlines" (NWA) объединилась с "Delta Air Lines" в 2008 году. Принадлежавшие "Northwest" самолеты A330-200 в 243-местном варианте отошли к "Delta", были перекрашены в ее цвета и начали полеты из Солт-Лейк-Сити. Обновленная "Delta" также унаследовала от NWA и самолеты A330-300 (на снимке) в двухклассной конфигурации с 34 местами бизнес-класса, именуемого "Business Elite", и 264 местами эконом-класса. Всего авиакомпания "Northwest" закупила 32 единицы A330 (11 A330-200 и 21 A330-300). "QANTAS". Решение авиакомпании "QANTAS" пополнить самолетами A330 свой флот среднемагистральных лайнеров имело огромное значение для компании "Airbus" - наконец удалось нарушить доминирование "Boeing" в парке ведущей австралийской авиакомпании, кроме того, это помогло заключить контракт на поставки самолетов A380. Данная сделка имела еще один аспект: 13 декабря 2007 года "QANTAS" получила 5000-й построенный самолет "Airbus" - им стал A330-200. В настоящее время парк "QANTAS" и ее компании "Jetstar" включает десять A330-300 и шесть A330-200 (на снимке), еще четыре A330-200 заказаны для эксплуатации на внутренних линиях. В 2009 году "QANTAS" продолжала эксплуатацию A330-300 в двухклассной компоновке - 30 мест в бизнес-классе и 267 мест в эконом-классе. Самолеты используются в основном для полетов в Шанхай, Гонконг и Сингапур. 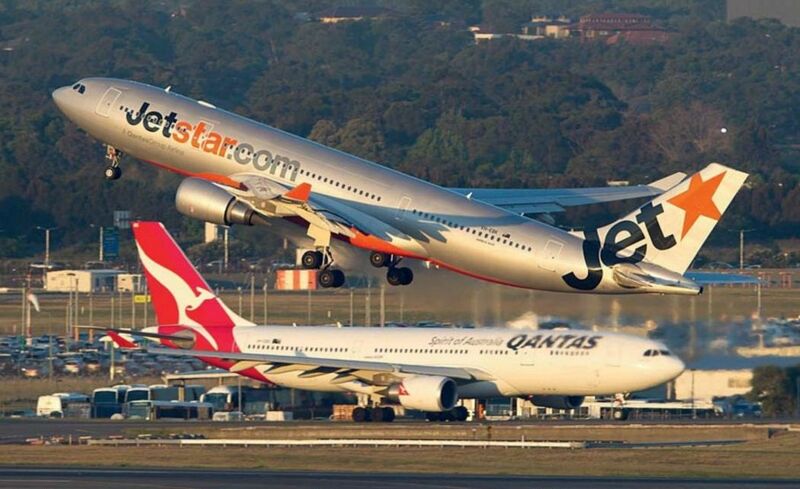 Также на дальних маршрутах компаниями "QANTAS" и "Jetstar" эксплуатируется по шесть A330-200. Самолеты "Jetstar" в двухклассной 303-местной конфигурации выполняют рейсы в Японию, Индонезию, Вьетнам, Малайзию, Сингапур, Таиланд и на Гавайи, тогда как A330-200 компании "QANTAS" на международных рейсах имеют 237- или 235-местную компоновку, а в 303-местном варианте работают на внутренних линиях. "Qatar Airways". Летом 2009 года парк авиакомпании "Qatar Airways" насчитывал 18 единиц A330-200 и 13 A330-300 (на снимке). A330-200 обычно выполняют полеты в 228-местном варианте (12 мест первого, 24 места бизнес-класса и 192 места эконом-класса) и в 281 -местном варианте (22 места в бизнес-классе и 259 - в эконом-классе). Полеты выполняются в Алжир, Гонконг, Индонезию, Японию, Малайзию, Сингапур, Великобританию и на Филиппины. Все самолеты A330 авиакомпании "Qatar Airways" оснащены двигателями General Electric CF6. На своих самолетах A330 и A340 авиакомпания "Qatar Airways" предлагает пассажирам, в зависимости от класса, услуги по индивидуальным аудио/видео трансляциям. 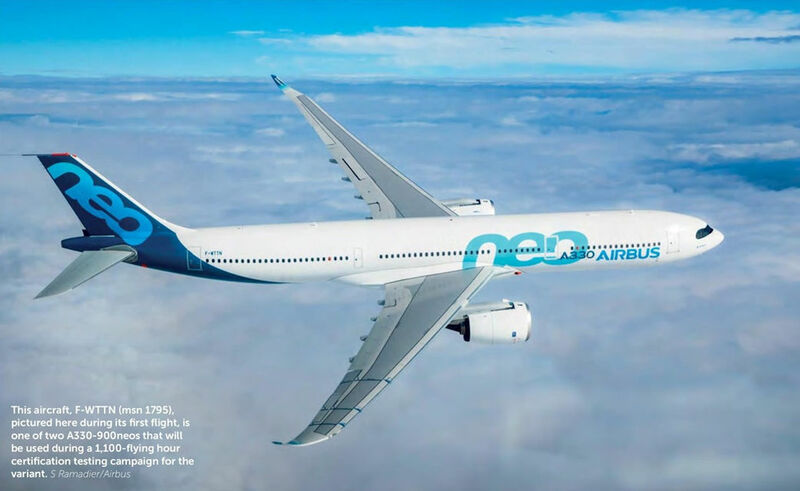 Following its service with Flynas during the summer of 2014, A330-300 CS-TMT (msn 96) was subsequently wet leased to Saudi Arabian Airlines in late 2014 and served with the carrier for much of 2015. The aircraft is seen at Tel-Aviv International Airport in May 2015. Airbus A330-343 F-WWKP (msn 1513) during a test flight at Toulouse-Blagnac in southern France on April 14, 2014. 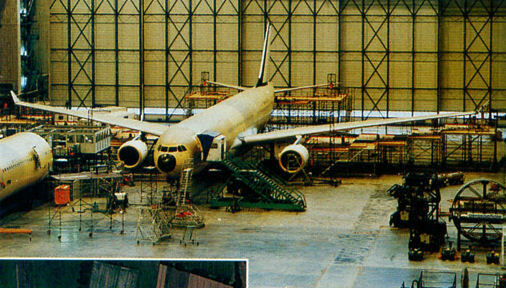 It was delivered ten days later to Saudi Arabian Airlines as HZ-AQL in SkyTeam colours, having first flown on March 6. 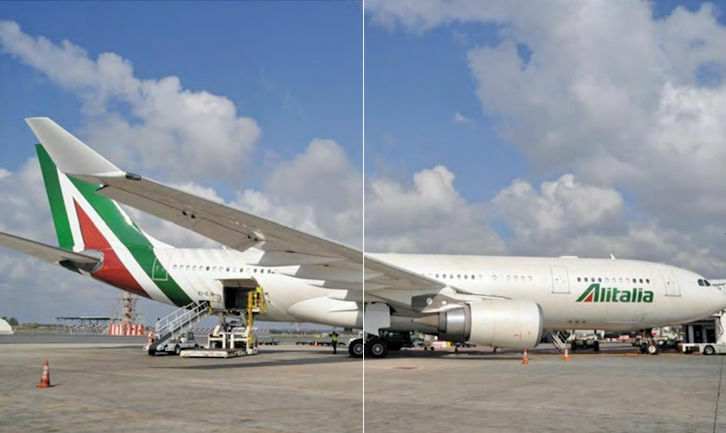 Saudi currently operates 12 A330-343s and has four additional series 300 aircraft leased from Onur Air. Scandinavian Airlines is the first European carrier to receive the higher-MTOW A330-300, and will operate four examples. 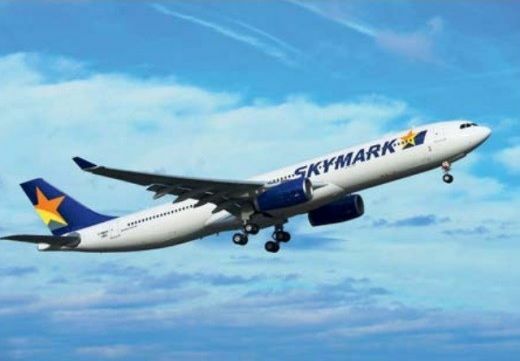 Airbus A330-343 F-WWKH (msn 1483) is the first of its kind for Skymark Airlines of Japan. The airliner is seen undertaking a test flight from Toulouse-Blagnac in southern France on January 21, 2014, having completed its first sortie on December 16, 2013. It will become JA330A upon delivery. Skymark is a low-cost carrier that flies Japanese domestic routes. 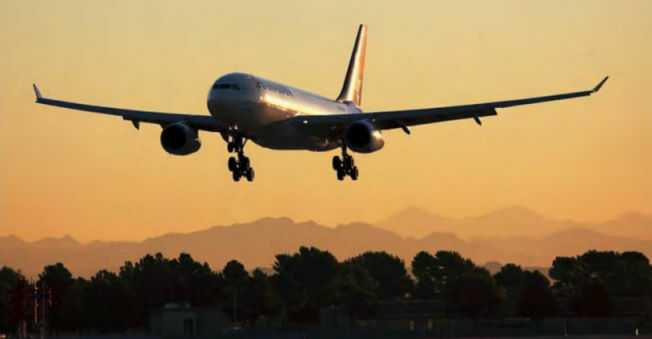 It announced in July 2012 that it would lease from Intrepid Aviation seven A330-300s equipped for 271 passengers in a single-class premium configuration. The Regional variant is primarily targeted at Asian carriers, such as Skymark, which in February 2014 became the first Japanese A330 operator. 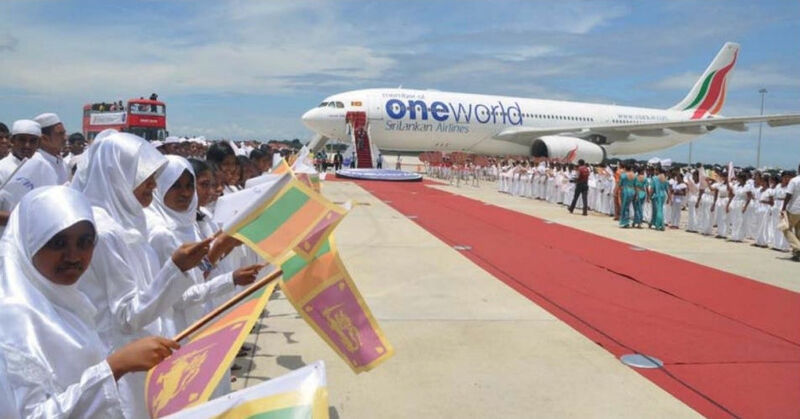 SriLankan Airlines recently introduced its Rolls-Royce Trent-powered Airbus A330-200 into service, as the first of nine on order to replace the company’s fleet of four Lockheed TriStars. 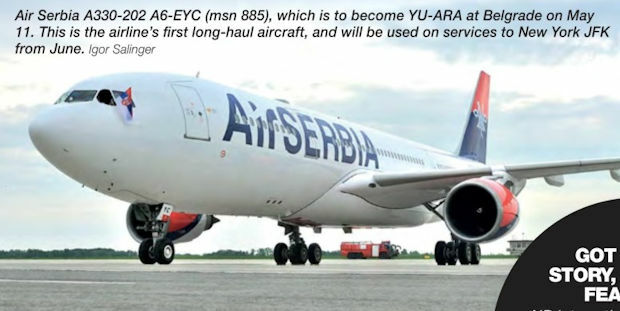 The new Airbus is operating on the Far East to Europe routes. 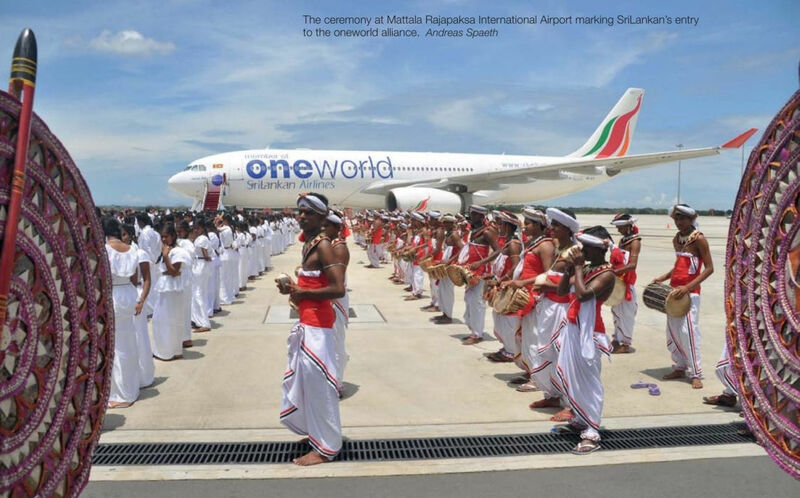 The ceremony at Mattala Rajapaksa International Airport marking SriLankan’s entry to the oneworld alliance. TAP Portugal has repainted A330-343 CS-TOV (msn 1006) into the livery worn by the airline in the 1960s and 1970s. The aircraft is pictured arriving at Lisbon-Humberto Delgado Airport. 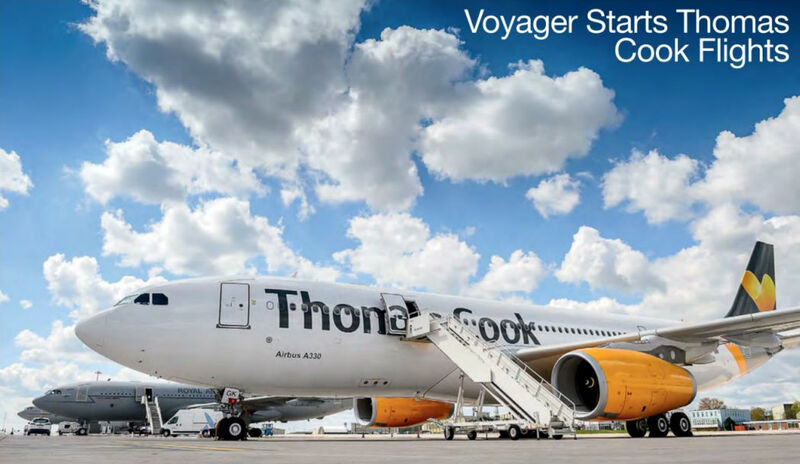 Thomas Cook Airlines is leasing A330-243 G-VYGK on an ACMI basis to conduct charter flights from UK airports. A Turkish Airlines A330 at Montreal, where the airline began flying in June 2014. 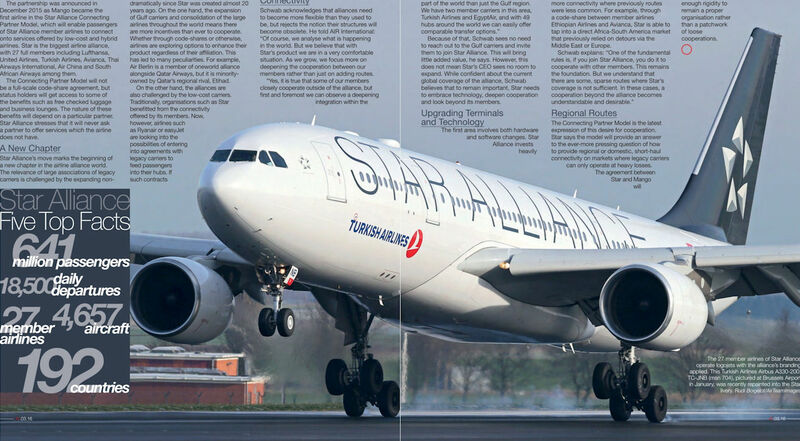 The 27 member airlines of Star Alliance operate logojets with the alliance's branding applied. This Turkish Airlines Airbus A330-200, TC-JNB (msn 704), pictured at Brussels Airport in January 2016, was recently repainted into the Star livery. 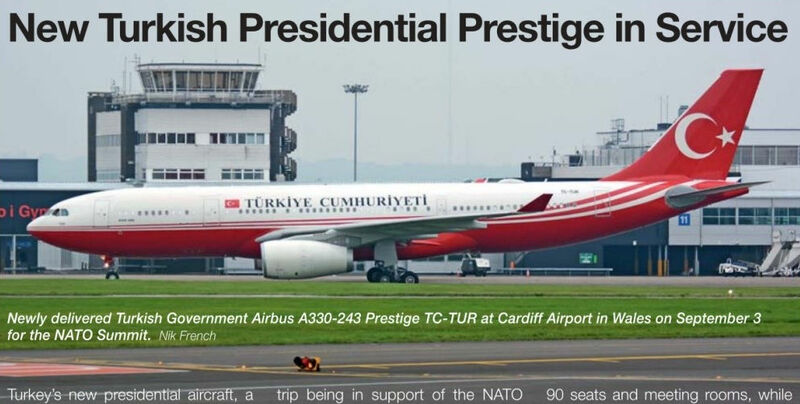 Newly delivered Turkish Government Airbus A330-243 Prestige TC-TUR at Cardiff Airport in Wales on September 3, 2014 for the NATO Summit. A330-200 N283AY (msn 1076) was delivered to US Airways in December 2009. The aircraft is one of 16 in service. Airbus A330-200 G-VLUV (msn 1206) is one often of the type in service with Virgin Atlantic Airlines. Virgin Australia A330-243 VH-KFE rotating from Sydney, one of Australia’s top five airports (the others being Melbourne, Brisbane, Perth and Adelaide) by passenger numbers. Airbus expects to see these airports' traffic double to 180 million in 20 years. Airbus A330-223 UR-WRQ (msn 296, ex CS-TRJ) is the first of its type for WindRose Aviation of the Ukraine. It is seen after being rolled out of the Air Livery hangar at Manchester Airport on August 4, 2013, after repainting from basic Malaysian Airlines scheme. The airliner departed for Boryspil International Airport, Kiev in the Ukraine, the following day. WindRose is a charter airline based at Boryspil and operates eight A320 family airliners. Hi Fly’s A330-300 CS-TRI (msn 127) is currently operating with XL Airways and is seen landing at Paris Charles de Gaulle in June 2016. Former Qantas Airbus A330-203 VH-EBH (c/n 892) landing at Getafe, Spain, on July 13, 2015, after arriving from Singapore for conversion to KC-30A tanker/transport configuration for the Royal Australian Air Force (RAAF). A second aircraft for conversion is due to arrive in November. Australia's defence minister, Kevin Andrews, had announced plans for their acquisition on July 1. 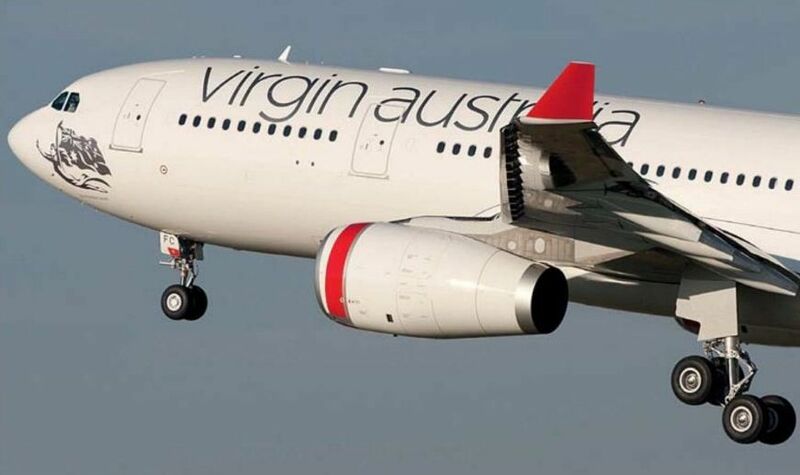 Both had been leased to Qantas by CIT Aerospace and are being returned to the US lessor before being sold to the Australian Department of Defence. They will join five KC-30As already in RAAF service. Airbus A330-243F F-WWYK (msn 1380, to become N331QT) is seen making its first flight from Toulouse in southern France on January 30, 2013. The freighter is destined for the Colombian carrier Tampa Cargo. 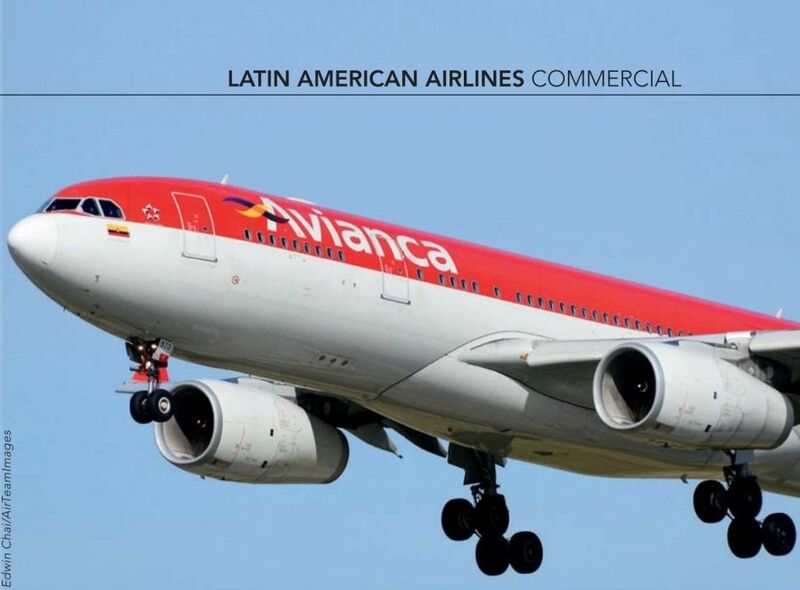 Four of the aircraft were ordered by Tampa Cargo's parent company, Avianca, in September 2011 to replace Boeing 767-241 ER(BDSF)s leased from CECAS. The first (N330QT, msn 1368, ex F-WWKQ) was delivered on December 19, 2012. A330 проходит вибрационные испытания. 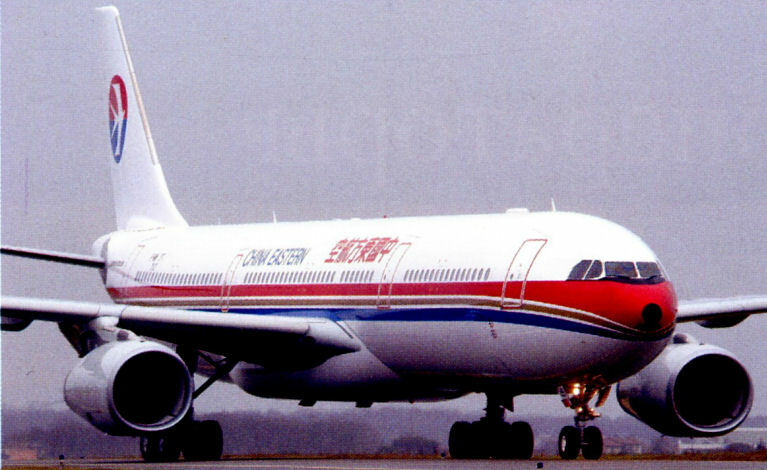 В октябре 1993 года A330 с двигателями CF6 одновременно получил европейский и американский сертификаты, а в ноябре 1994 года его сертифицировали по критерию "120-минутного полета" норм ETOPS. В мае 1994 года "Aer Lingus" выполнила первый трансатлантический полет с двигателями CF6 по нормам ETOPS. Композитные материалы составляют примерно 13% массы крыла A330 и A340, хотя основная конструкция выполнена из алюминиевого сплава. BAe первоначально выпускала крылья для A330 на заводе в британском Честере, но в 2006 году "BAE Systems" продала свою долю акций в "Airbus" компании EADS. Крылья для A330 продолжают выпускать на том же заводе, но теперь он называется "Broughton" и принадлежит "Airbus". "Семейственность" является важным преимуществом как для производителя, так и для покупателей. Лайнеры A330 (на снимке) и A340 имеют высокую степень унификации. 25 апреля 1995 года, всего через два года после начала коммерческой эксплуатации A340, со стапеля сошел сотый фюзеляж A330/A340. Юбилейной машиной стал A330-300. The first 242 tonne A330-202 F-WWYY (msn 1628), destined for Delta Air Lines, takes off from Toulouse. Airbus A330-202 F-WWCB (msn 871, ex EC-332) departed Getafe, Spain for Dresden in Germany on July 17, 2013 using the flight code AIB871. The aircraft would have been the first KC-45A produced by Northrop Grumman for the US Air Force, but the original KC-X programme for which it was destined was cancelled before it could be converted. It arrived for storage at Getafe on March 24, 2009. The aircraft will undergo a C-check at Dresden. The AIB code is used by Airbus, possibly indicating that the aircraft has been transferred from Airbus Military to the company's commercial division. 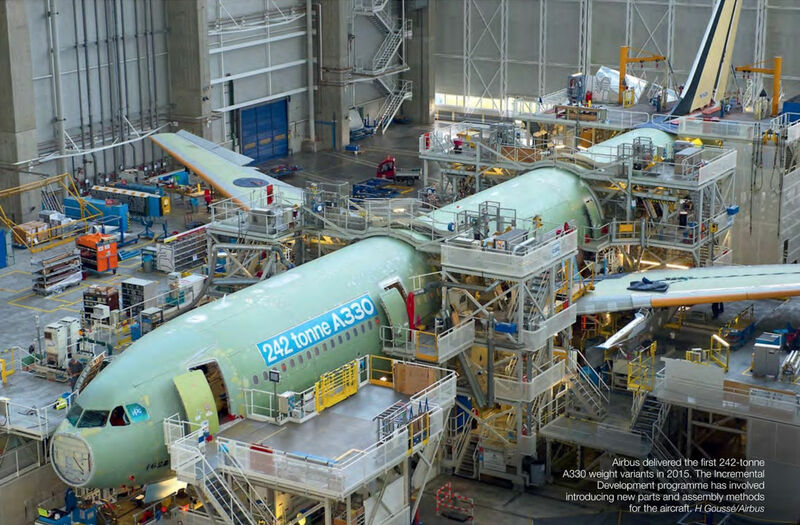 Airbus delivered the first 242-tonne A330 weight variants in 2015. 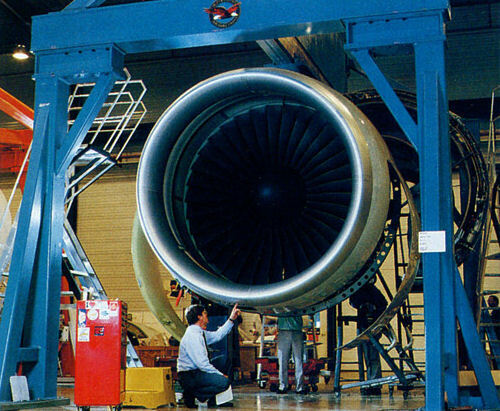 The Incremental Development programme has involved introducing new parts and assembly methods for the aircraft. This aircraft, F-WTTN (msn 1795), pictured here during its first flight, is one of two A330-900neos that will be used during a 1,100-flying hour certification testing campaign for the variant. Rolls-Royce Trent 7000 engines with their 112-inch (2.8m) fan diameter and Sharklet wingtip devices make the A330neo stand out from older A330 variants. 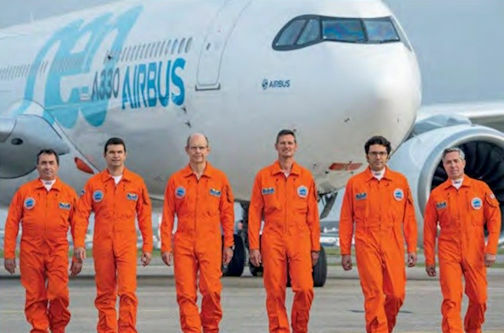 The six-member crew for the A330neo's maiden flight (from left to right): Flight Test Pilot Engineer Alain Pourchet; Flight Test Engineer Jean-Philippe Cottet; Flight Test Engineer Gert Wunderlich; Experimental Test Pilot Thomas Wilhelm; Flight Test Engineer Emiliano Requena Esteban; and Experimental Test Pilot Thierry Bourges. The first A330-900neo rolled out late in December. 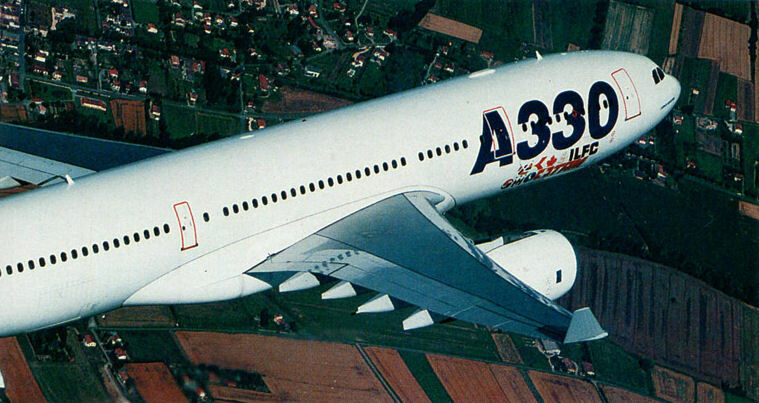 Note the Sharklet wingtip devices and the ‘shades’ cockpit design, two of the main visual differences from older A330s. 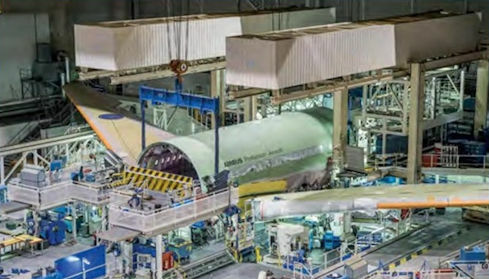 The first A330-900, seen here in the Toulouse paint shop, is due to fly in the first half of this year. 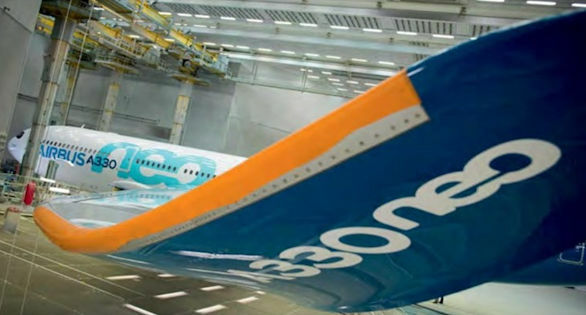 Assembly work on the initial Airbus A330-800neo is underway in Toulouse ahead of its planned mid-2018 first flight. 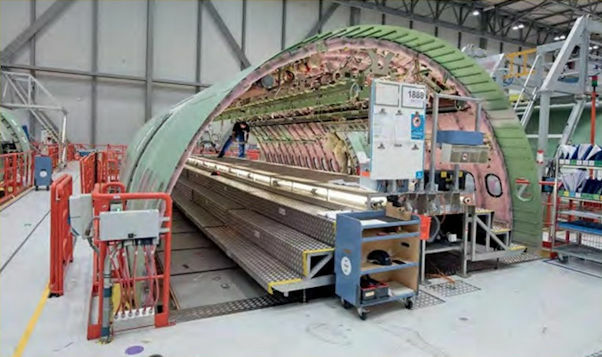 The fuselage section for the first Airbus A330-800neo under assembly in Hamburg. Final assembly of the aircraft is due to start by the end of the year. 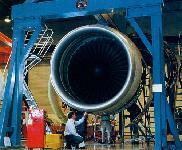 Во второй половине 1993 года "Pratt & Whitney" поставила в Тулузу первые PW4168 для A330. Вентилятор диаметром 2,5 м сделал PW4168 самым большим двигателем из устанавливаемых на самолетах "Airbus" до настоящего времени. 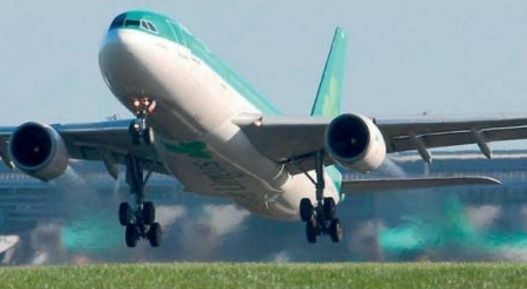 Airbus’s decision about whether to re-engine the A330 family is keenly awaited. 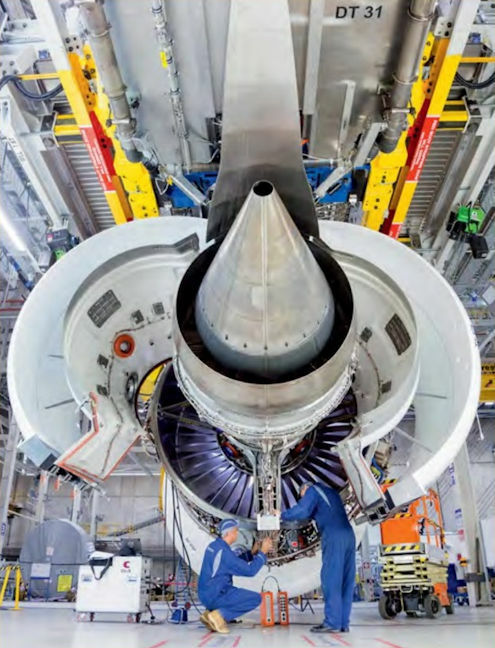 The first demonstrator engine of the Trent 7000, the seventh member of the Trent family, recently had its first run. The engine will power the A330neo.